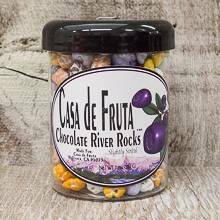 Chocolate shaped, multi-colored river rocks, great for snacking or decorating cookies and cake. They are sure to add a special touch to any pastry. Packaged in a 7.2 oz. jar.